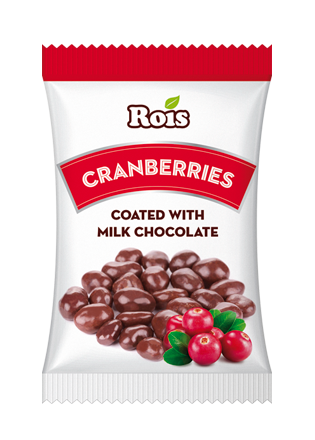 Ingredients: milk chocolate (sugar, cocoa butter, whole milk powder, fat-reduced cocoa powder, emulsifiers: soy lecithin, Е476; flavoring: vanilla), cranberries (cranberries, sugar, sunflower oil), glazing agent: shellac; glycerol, dextrose syrup, acacia gum, polysaccharides, vegetable oil. The product may contain traces of tree nuts, peanuts and gluten. 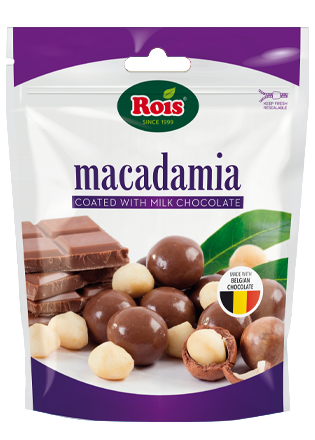 Ingredients: MILK chocolate (sugar, cocoa mass, cocoa butter, whole MILK powder, emulsifier: SOY lecithin; natural flavoring: vanilla), MACADAMIA, sugar, glazing agent: shellac; glycerol, dextrose syrup, WHEAT starch, acacia gum, vegetable oil. Packaged in a protective atmosphere- nitrogen. The product may contain traces of other NUTS and PEANUTS. 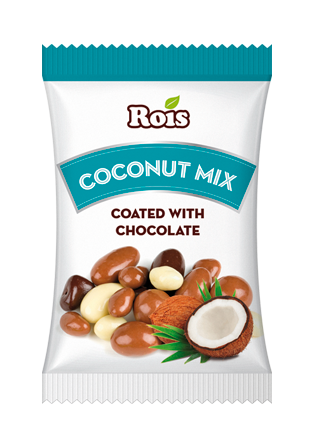 Ingredients: coconut cubes (coconut, wheat starch, glucose-fructose syrup, sugar, dextrose, gelatin, salt); chocolate: dark chocolate (sugar, cocoa mass, cocoa butter, emulsifiers: soy lecithin, Е476; flavouring: vanilla), milk chocolate (sugar, cocoa butter, whole milk powder, fat-reduced coco powder, emulsifiers: soy lecithin, Е476; flavouring: vanilla), white chocolate (sugar, cocoa butter, whole milk powder, lactose, skimmed milk powder, emulsifier: soy lecithin, flavouring: vanilla); glazing agent: shellac; glycerol, dextrose syrup, acacia gum, sugar, polysaccharides, vegetable oil. The product may contain traces of tree nuts and peanuts. 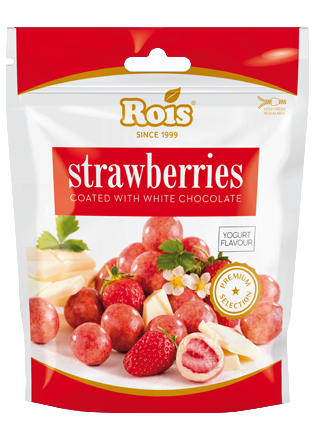 Ingredients: white chocolate (sugar, cocoa butter, whole milk powder, lactose, skimmed milk powder, emulsifier: soy lecithin, flavouring: vanilla), dehydrated strawberries, glazing agent: shellac; glycerol, dextrose syrup, acacia gum, sugar, wheat starch, vegetable oil, flavouring: yogurt. Packaged in a protective atmosphere- nitrogen. The product may contain traces of tree nuts and peanuts. 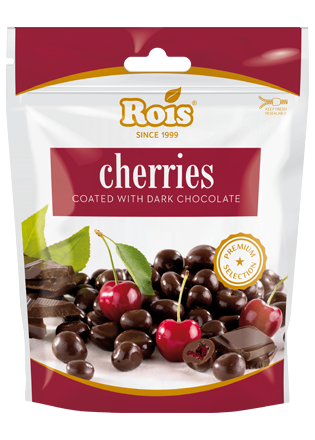 Ingredients: dark chocolate couverture (sugar, cocoa mass, cocoa butter, emulsifiers: soy lecithin, E476; flavouring: vanilla), dry pitted cherry, glazing agent: shellac; glycerol, dextrose syrup, acacia gum, sugar, wheat starch, vegetable oil, flavourings. Packaged in a protective atmosphere- nitrogen. 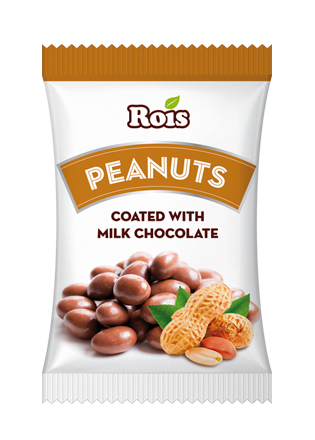 The product may contain traces of nuts, peanuts, milk and pit fragments. 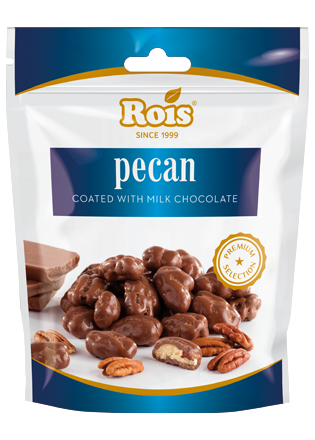 Ingredients: milk chocolate couverture (sugar, cocoa butter, whole milk powder, fat-reduced cocoa powder, emulsifiers: soy lecithin, Е476; flavouring: vanilla), pecan, sugar, glazing agent: shellac; glycerol, dextrose syrup, wheat starch, acacia gum, vegetable oil. The product may contain traces of other nuts and peanuts. 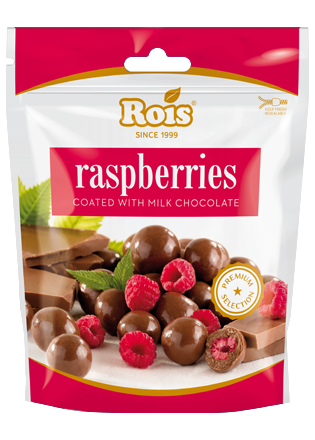 Ingredients: milk chocolate couverture (sugar, cocoa butter, whole milk powder, fat-reduced cocoa powder, emulsifiers: soy lecithin, Е476; flavouring: vanilla), dehydrated raspberries, glazing agent: shellac; glycerol, dextrose syrup, acacia gum, sugar, wheat starch, vegetable oil, flavourings. Packaged in a protective atmosphere- nitrogen. The product may contain traces of nuts and peanuts. 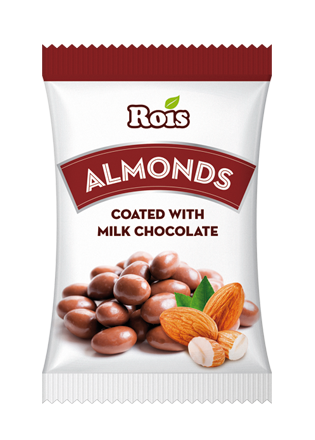 Ingredients: milk chocolate (sugar, cocoa butter, whole milk powder, fat-reduced cocoa powder, emulsifiers: soy lecithin, E476; flavoring: vanilla), peanuts, sugar, glazing agent: shellac; glycerol; dextrose syrup, acacia gum, polysaccharides, vegetable oil. The product may contain traces of tree nuts and gluten. 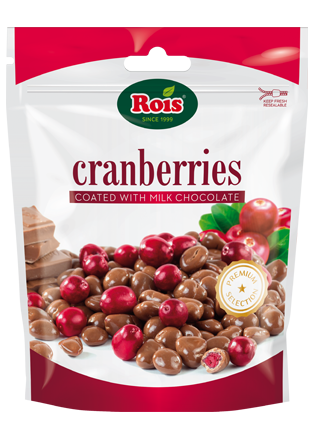 Ingredients: chocolate: dark chocolate (sugar, cocoa mass, cocoa butter, emulsifiers: soy lecithin, E476; flavouring: vanilla), milk chocolate (sugar, cocoa butter, whole milk powder, fat-reduced cocoа powder, emulsifiers: soy lecithin, E476; flavouring: vanilla), white chocolate (sugar, cocoa butter, whole milk powder, lactose, skimmed milk powder, emulsifier: soy lecithin, flavouring: vanilla); crispy cereal balls (wheat flour, corn flour, sugar, fat-reduced cocoa powder); glazing agent: shellac; glycerol, dextrose syrup, acacia gum, sugar, polysaccharides, vegetable oil. The product may contain traces of tree nuts and peanuts. 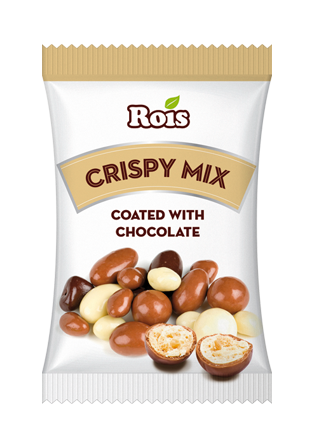 Ingredients: milk chocolate (sugar, cocoa butter, whole milk powder, fat-reduced cocoа powder, emulsifiers: soy lecithin, E476; flavoring: vanilla), almonds, sugar, glazing agent: shellac; glycerol, dextrose syrup, acacia gum, polysaccharides, vegetable oil. The product may contain traces of other nuts, peanuts and gluten. 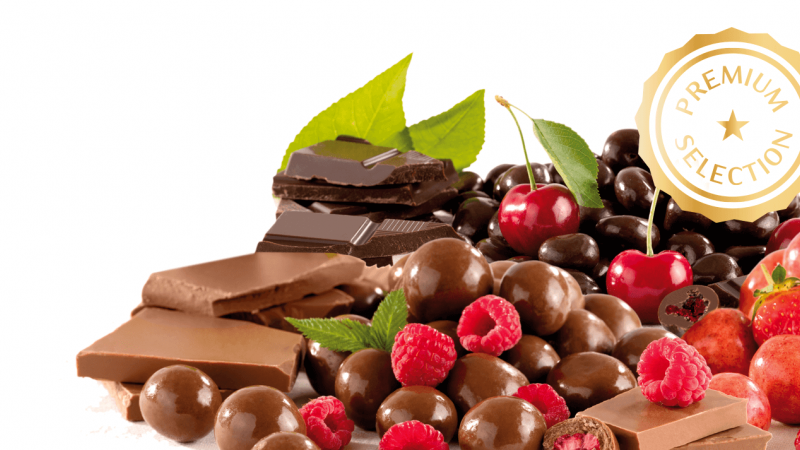 Ingredients: milk chocolate (sugar, cocoa butter, whole milk powder, fat-reduced cocoа powder, emulsifiers: soy lecithin, E476; flavouring: vanilla), hazelnuts, sugar, glazing agent: shellac; glycerol, dextrose syrup, acacia gum, polysaccharides, vegetable oil. 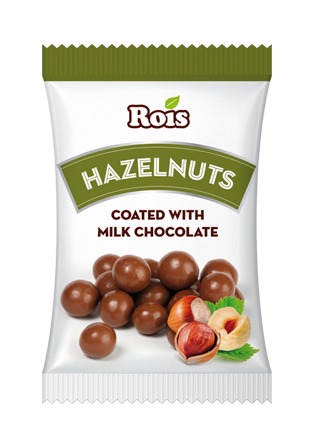 The product may contain traces of other tree nuts, peanuts and gluten. 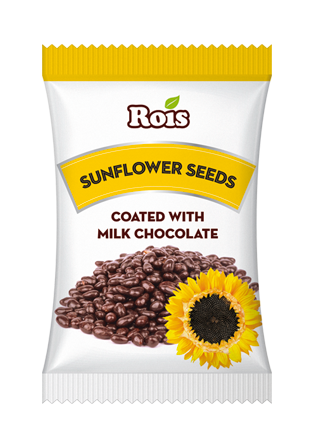 Ingredients: milk chocolate (sugar, cocoa butter, whole milk powder, fat-reduced cocoa powder, emulsifiers: soy lecithin, E476; flavouring: vanilla), sunflower seeds, sugar, glazing agent: shellac; glycerol, dextrose syrup, acacia gum, polysaccharides, vegetable oil. The product may contain traces of tree nuts, peanuts and gluten. Ingredients: milk chocolate (sugar, cocoa butter, whole milk powder, fat-reduced cocoa powder, emulsifiers: soy lecithin, E476; flavorings: vanilla), raisins, sugar, glazing agent: shellac; glycerol, dextrose syrup, acacia gum, polysaccharides, vegetable oil. The product may contain traces of tree nuts, peanuts and gluten.